How Does Gingko Biloba Work? Ginkgo biloba is one of the oldest trees on earth, and is one botanical that has been investigated very extensively to determine whether its leaves can be used for medicinal purposes, according to the University of Maryland Medical Center (UMMC). Ginkgo dietary supplements are top sellers in the U.S. and Europe, and it's commonly prescribed in European countries such as France and Germany. The medicinal uses of ginko biloba are as vastly impressive as the tree itself. However, its more popular purported benefit–to improve memory–may not be a benefit at all, if you're a healthy adult. Long before it became popular in Europe and the U.S., ginkgo biloba was used in traditional Chinese medicine for thousands of years, according to the University of Michigan Health System. The ginkgo is a hardy tree, living as long as 1,000 years and growing as tall as 120 feet, the UMMC says. Its leaves have a fan-like presentation, and the tree bears an inedible fruit with seeds that are reportedly poisonous to humans. Although traditional Chinese medicine used the ginkgo biloba seeds and leaves, modern preparations use only the extract derived from the tree's leaves. Numerous components are found in ginkgo biloba, but only two may be active constituents that make it useful for medicinal purposes. The UMMC indicates that these are the herb's flavonoids, plant-based antioxidants; and terpenoids, which may improve blood flow. Ginkgo's flavonoids may benefit the nerves, heart muscles, blood vessels and retinas, as suggested by the results of in vitro and in vivo studies. Ginkgo biloba is available in standardized extracts that contain between 24 percent to 32 percent flavonoids and between 6 percent and 12 percent terpenoids. You can buy ginko products in dried preparations, such as capsules and tablets, or liquid formulations. Dried ginkgo leaf may also be brewed into tea. According to the Memorial Sloan-Kettering Cancer Center, ginkgo is used for a variety of disparate purposes--some of which are backed by science. Others are not–or findings are contradictory. The center says there's no clinical evidence to suggest that ginko is helpful for stress, anxiety, heart disease and tinnitus. Limited evidence is available to recommend ginko for use in circulatory disorders, Raynaud's disease, sexual dysfunction and acute mountain sickness. Ginkgo biloba is often suggested for enhancing memory. However, the cancer center reports that although several clinical studies have suggested it's beneficial to treat dementia, more recent evidence suggests that healthy adults don't receive the same benefit. Similarly, many clinical trials support its use in treating Alzheimer's disease and dementia, but more recent research suggests the contrary. According to the cancer center, there is sufficient evidence to indicate that ginkgo biloba is most helpful for sudden hearing loss. Do not take ginkgo biloba if you're pregnant or breastfeeding or have epilepsy, cautions the UMMC. Don't give ginkgo to children. Avoid eating the fruit and seeds. Stop taking ginkgo biloba at least 36 hours before getting dental work or having surgery, as it may affect how quickly your blood clots. Internal bleeding has been reported by some people taking ginkgo biloba, the UMMC says, but it's not clear whether this was related to ginkgo itself or a combination of ginkgo biloba and other blood thinners. Otherwise, ginkgo is considered a safe herb to take, and rarely are there side effects. Such side effects may include headache, skin reactions, dizziness and gastrointestinal upset. 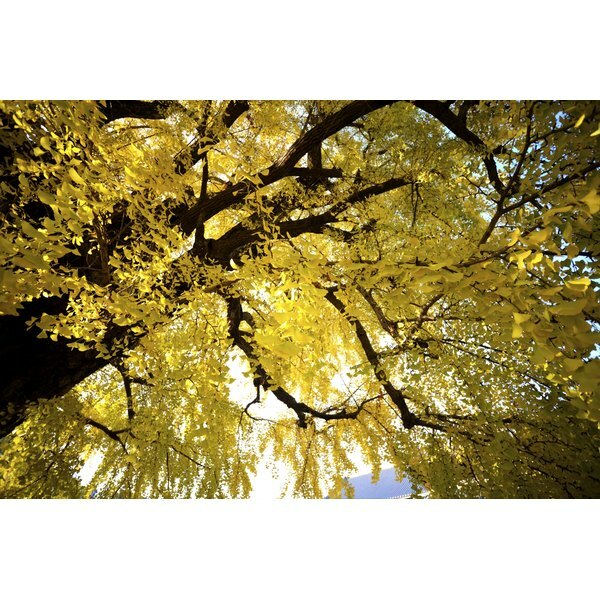 Taking ginkgo biloba with certain medications can affect how they're metabolized in your body. The UMMC urges you to talk to your doctor before taking ginkgo if you also take anticonvulsants (seizure medications), selective serotonin reuptake inhibitor antidepressants (SSRIs), blood pressure or blood-thinning medications (including aspirin), cyclosporine, trazodone, drugs to lower blood sugar levels and diuretics. Always speak with your doctor before you take ginkgo biloba or another herbal supplement to address a specific medical concern, even if you're in good health.